Phospholipid Removal TopTip enables broad-spectrum phospholipid capture in a micro-spin column format. The fine 1-2 µm slit at the bottom of the TopTip permits liquid to pass through (with pressure via centrifuge or syringe), but retains the unique TiO2+ZrO2 mixed media in the tip. This eliminates need for a filter – reducing dead volume, loss of sample and contamination risk. 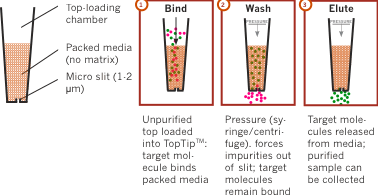 Click the button below to add the Phospholipid Removal TopTip to your wish list.